Corey Feldman has never met a paparazzi he didn’t want to show his fingers to. He’s in New York promoting his new movie A Tale of Two Coreys about his and the late Corey Haim’s success and struggles in Hollywood. Feldman is credited as one of the writers and producers of the film, so naturally he hired good looking actors to play himself (as a child and older.) We’re guessing the movie revolves mostly around HIM. The last time we saw the tragic Corey Haim – he was smoking outside one of those celebrity autograph shows and he told the photographers – both pros and amateurs – crowded around him, that for $50 he’d go to their hotel room and pose for them privately. We can’t decide if Corey Feldman, 46, aspires to be the next Michael Jackson or the next Hugh Hefner. Most likely a twisted combination of both. His weird fashion and the fact that he tours with his all female band “Corey Feldman & the Angels” (if you haven’t seen their Today Show performance, you must) implies that he would like a chunk of Michael Jackson’s popstar fame and fortune. And the fact that he takes “blondes of good character” under his wing and promotes their careers (sometimes they live with him) is reminiscent of Hugh Hefner. Oh, and he married a blonde (his wife Courtney in the sailor dress) who doesn’t seem to mind having the other girls around. Corey Feldman is 43 and has been divorced twice, and he’s still struggling to get his acting career back on track. It’s strange, but he doesn’t seem able to make up his mind about his one-time buddy Michael Jackson. He was very upset when Michael died but also had doubts about Michael’s innocence when it came to his behavior with little boys. One minute Corey accuses Michael of improprieties, the next he defends his former friend. Above, he’s arriving at a Hollywood club with two young girls and a Charlie Sheen smirk on his face. Corey Feldman picked up a pizza to go at Mulberry Street Pizzeria in Beverly Hills and was quite friendly when he was stopped by a street magician and asked to pick a card. Corey happily chatted with fans despite the fact that his pie cooled off. He was recently bumped off the UK show “Dancing On Ice” when Charlene Tilton outskated him, but the viewers made fun of the long strand of hair he’s been cultivating that hangs in his face. He may or may not, have finally cut it off. Corey Haim’s last movie, “Decisions,” premiered at the Writer’s Guild this weekend and his family and friends were invited to pay tribute to Corey, who died last year at the age of 38. Corey played a corrupt LAPD detective in the low budget indie film. Corey’s costar from “Murphy’s Romance,” Sally Field, and his long-ago girlfriend, Alyssa Milano, as well as Corey Feldman, were among the many guests. Feldman is still sporting an evolving version of that odd haircut. 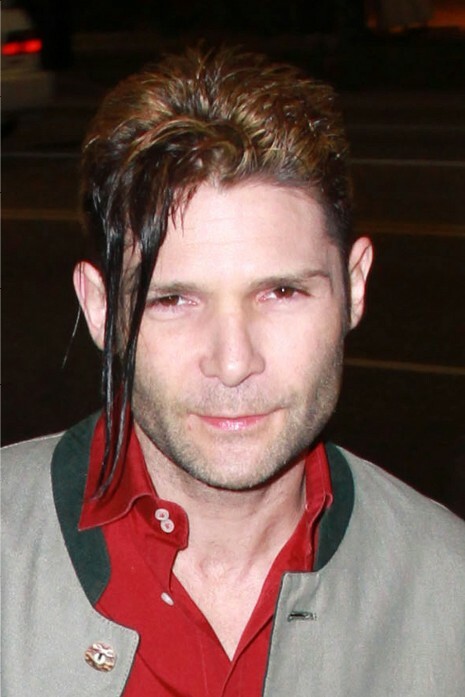 Corey Feldman sported this puzzling look as he was leaving a party in Hollywood. It defies analysis. Hopefully, he’ll see this photo and come to his senses and rush to a barber shop. Filed Under: Corey Feldman > Hair!